Stir fried Beef with shallots. This is the story of a young boy who lived in a small town in Kerala. He was the youngest among his six brothers and this earned him special privileges in the family. One of the privileges of his life then was that he would always get a portion of special dishes cooked for the elders of the family. It was very common in those days to save the best dishes for the head of the family and to be able to have a taste of those was a rare treat. He would wait to have dinner with his dad when ever his mother prepared this special beef fry and his dad never disappointed him. Days and years went by, everything around him changed but his love for the beef fry his mother made remained the same. This young boy is my father and every time he narrates this story to us he would be beaming with joy. You would be surprised to know this beef fry has proven to have medicinal powers and works better than antipyretic in treating fever in the case of my dad. Every time he falls sick my mother makes sure he gets a dose of his mom’s beef fry along with the tablets. This is definitely the ultimate comfort food for him not just for taste but for the flood of memories it brings back. 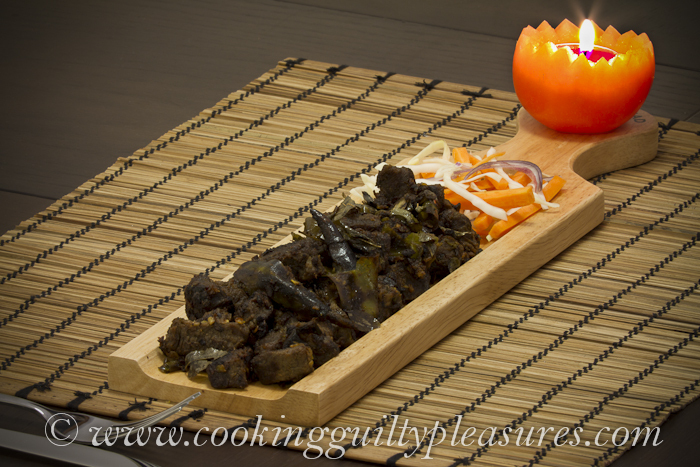 I am excited to share the recipe with you and you would be amazed to know a beef fry recipe can’t get any simpler. Wash the beef and place in a pressure cooker. Add 1/2 cup of water and salt to taste and cook for about 10 minutes after the first whistle. Alternatively, you can cook the beef in a regular pan with enough water to cover the beef for about 30 minutes until the meat is soft. Make sure there is at least half a cup of stock remaining in the pan at the end of cooking. Add the chopped shallots, chopped ginger, slit green chillies and vinegar to the beef and cook until all the liquid in the pan is gone. Heat oil in a non-stick pan .Transfer the contents of pressure cooker to the pan. Add curry leaves and fry it on a low flame until the meat is browned as seen in the picture. Serve it as side for rice or even better use it as filling for your tortilla wrap. This entry was posted on January 16, 2011 by saumyaroy. It was filed under Appetizers, Beef, Kerala, Main and was tagged with Beef, Beef fry, kerala, Kerala beef fry. ya my daughter is right .. and i think she has inherited the culinary genes from her grand mothers who were famous cooks of their time specialised in syrian christian dishes ..all the best for u ponnu mol in ur new venture..